LcMCII - 1 is a type II metacaspase. Over-expression of LcMCII- 1 in Arabidopsis promoted ROS-dependent and natural senescence. Virus-induced LcMCII- 1 silencing delayed the ROS-dependent senescence of the rudimentary leaves of Litchi chinensis . Litchi is an evergreen woody fruit tree that is widely cultivated in subtropical and tropical regions. Its floral buds are mixed with axillary or apical panicle primordia, leaf primordia and rudimentary leaves. A low spring temperature is vital for litchi production as it promotes the abscission of the rudimentary leaves, which could otherwise prevent panicle development. Hence, climate change could present additional challenges for litchi production. We previously reported that reactive oxygen species (ROS) can substitute low-temperature treatment to induce the senescence of rudimentary leaves. We have now identified from RNA-Seq data a litchi type II metacaspase gene, LcMCII-1, that is responsive to ROS. Silencing LcMCII-1 by virus-induced gene silencing delayed ROS-dependent senescence. The ectopic over-expression of LcMCII-1 in transgenic Arabidopsis promoted ROS-dependent and natural senescence. Consistently, the transient expression of LcMCII-1 in tobacco leaf by agroinfiltration resulted in leaf yellowing. 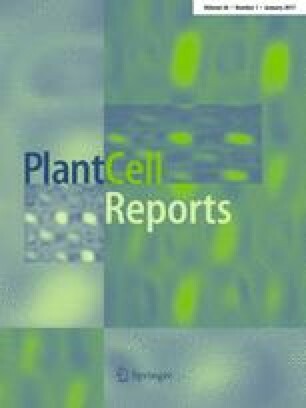 Our findings demonstrate that LcMCII-1 is positively involved in the regulation of rudimentary leaf senescence in litchi and provide a new target for the future molecular breeding of new cultivars that can set fruit in warmer climates. Communicated by M. C. Jordan. The online version of this article (doi: 10.1007/s00299-016-2059-y) contains supplementary material, which is available to authorized users. This work was supported by the National Natural Science Foundation (project no. 31071760) and the China Agricultural Industry Project (project no. CARS-33-08).